To refer a candidate to me, please complete the short form below. If you would rather give me a call, my direct line is 07702 869368. Click to confirm you are happy to receive marketing emails from Churchill Knight about referral promotions and important news affecting recruitment agencies. 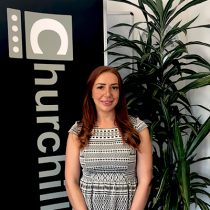 My name’s India and I’m a Business Development Manager at Churchill Knight. I’m very much a “people person” and feel very lucky that a big part of my job is working with other people to help their Business’s grow. Most importantly I’m genuinely passionate about my job and what I do, I’ve been in the industry for over 6 years and prior to the Payroll and Accounting industry I worked in Medical recruitment. I believe my background gives me a good understanding of what agencies and candidates want and of course don’t want! For me I see my job as a tool to help Agencies grow and develop, the focus for them should be placing candidates and sourcing the clients, I’m here to make sure the candidates are paid on time and set-up quickly. Should you be an Established agency looking for a payroll provider that actually does what they say they will do, or a perm agency who wants to move into the temporary/contract market and isn’t sure where to start, please do get in touch as I will be able to advise you on the most suited and compliant options for your candidates. Outside of work you will find me down the stables, walking my dog, at the gym or with my friends socialising. I look forward to hearing from you! You can contact me by calling 07702 869368 or emailing me – india.sykes@churchill-knight.co.uk.